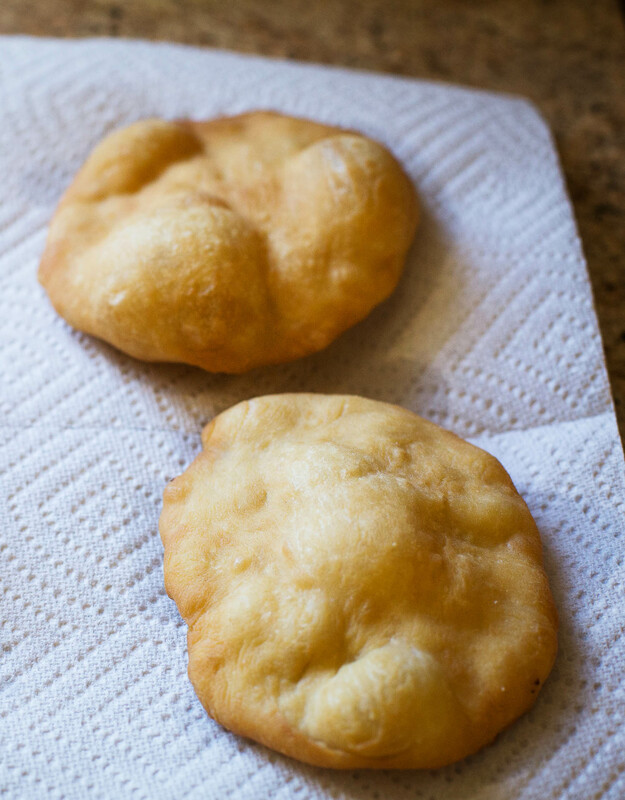 This post was sponsored by Visit USVI through their partnership with PopSugar. While I was compensated to write a post about Visit USVI, all opinions are my own. Thank you so much for supporting the brands that make Diary of a Debutante possible! Diamonds Adventures are forever. There’s something so therapeutic about just getting lost in a new world and simply embracing the journey. Whether you’re vacationing solo or with you friends, family, or S.O., this J.R.R. Tolkien quote always rings true: “Not all who wander are lost.” If you’re looking for a trifecta of Instagram-worthy spots to take a fun and adventurous vacation, the U.S. Virgin Islands will not disappoint. I went on a spontaneous last-minute cruise to the U.S. Virgin Islands with my BFF Sarah for spring break a few years ago (right before she moved to Washington DC to advocate for education and rethinking homelessness), and it was such an incredible experience. We were young and single (at least at the time), so above all else, finding adventure was pretty much our #1 priority. We bonded, we partied, and we made some really incredible memories! For anyone in search of adventure and spontaneity, St. John is the place to be. It’s surrounded by stunning crystal blue water, it’s eco-friendly, and two-thirds of the island is part of the National Park Service. In terms of things to do in the U.S. Virgin Islands, St. John is the island for tackling all things outdoors. One of St. John’s most popular beaches is Cinnamon Bay. In addition to snorkeling, this gorgeous beach offers plenty of water sports and activities, including swimming, windsurfing, and kayaking. While you’re there, you can take guided tours of nearby landmarks and historic spots or you can go rogue and wander the self-guided half-mile loop known as Cinnamon Bay trail. My personal favorite memory from St. John is snorkeling in Trunk Bay, which is consistently voted one of the most beautiful beaches in the world. It’s officially part of the U.S. Virgin Islands National Park, so they maintain an underwater snorkeling trail within its coral reef. If you’re not a fan of snorkeling, Trunk Bay’s also got snack bars, showers, restrooms, and a breathtaking beach with soft white powdery sand. As you can probably tell, Sarah and I went snorkeling on one of their cloudier days, too, and still– the scenery is just incredible. Other popular beaches include Honeymoon Beach, which is only accessible by boat or hiking trail, Maho Bay, which is popular for families, and Hawksnest Beach, which offers plenty of parking, picnic tables, and barbecue grills for group shindigs. Wherever you decide to exhaust yourself with breathtaking water sports, there’s plenty more adventuring to do! 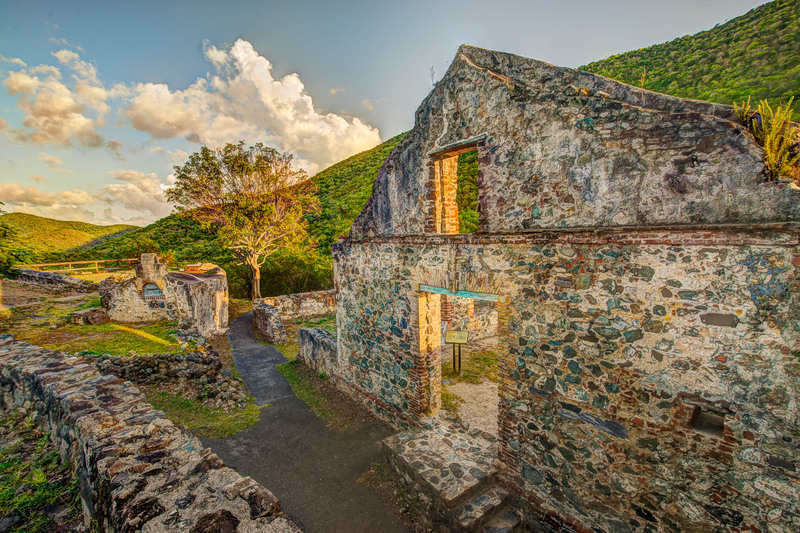 The Annaberg Sugar Plantation Ruins are part of the St. John’s National Park, and they’re definitely a sight worth seeing. This is the plantation that produced the island’s sugar, molasses, and rum back in the 1780s, so it’s literally filled with rich and sweet island history. Other great historical spots are the Peach Hill Ruins, which feature one of the most dramatically scenic views on the island, and Reef Bay Trail. Reef Bay Trail is the most popular trail in the entire National Park, and if you make the hike, you’ll see historic remains of four large sugar estates, plus ancient petroglyph rock carvings. While St. John is more known for its National Park and plethora of outdoor activities, St. Croix is more known for its exquisite dining, local distilleries, hand-crafted jewelry, and cultural/agricultural landmarks. The beaches aren’t too shabby either. First and foremost, St. Croix is home to a special treat for any and all geography fans– Point Udall, the easternmost point of the United States. Another really beautiful spot, especially for architecture fans, is the Old Danish Customs House. It sits on the lawn in front of Fort Christiansvaern, which was built by the Danish for defense against pirate and privateers. The Customs House has wonky hours, so you may not be able to get inside for a tour unless you confirm it’s open. Either way, it’s a great location for a little history and for some seriously gorgeous photos! Other must-visit attractions are St. George Village Botanical Garden, Estate Whim Plantation Museum, and Salt River Bay National Historic Park and Ecological Preserve, which is a living museum on St. Croix. Salt River Bay is home to some of the largest mangrove forests in the Virgin Islands, as well as Prehistoric and colonial-era archeological sites, coral reefs, and a submarine canyon. The shopping is pretty incredible, too. 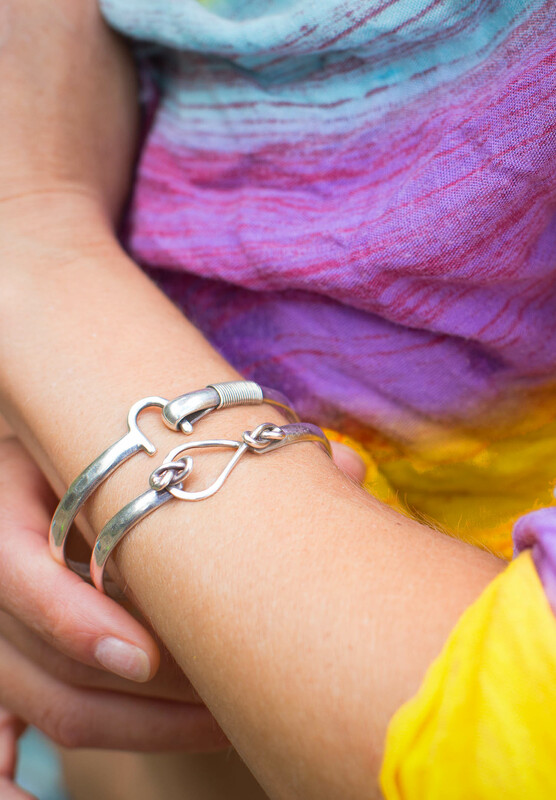 If you’re a fan of local hand-crafted jewelry, you’ll be in heaven in St. Croix! Below are two photos of gorgeous jewelry from Crucian Gold in Christiansted, St. Croix. Oh, did I mention the warm sunny beaches and ocean life? To name just one, Butler Bay is quiet beach located in Frederiskted, and it’s a great spot for diving, as well. Below are some amazing underwater photos taken at The Wreck of the Coakley Bay Tugboat and Fredericksted Pier. Last but not least– my personal favorite, St. Thomas. St. Thomas is known for its upbeat vibe, world class shopping, and colorful nightlife. It’s essentially 32 square miles of honest-to-goodness fun. Whether you’re with your besties on an epic girls trip or your new spouse on your honeymoon, you’ll have the time of your life on this breathtaking island! The water is crystal blue just about everywhere, but my two favorite beach spots are Sapphire Beach and Lindquist Beach. Both are pristine, quiet, and well adept for water sports. If you’re looking for more action and activity, head over to St. Thomas’ most popular beach, Magens Bay. It’s much more commercialized with lifeguards, beach chairs and floats for rent, and a plethora of snack options. Also, St. Thomas is rather mountainous, so Drake’s Seat, which is one of the island’s best lookouts with panoramic views of Magens Bay and the neighboring British Virgin Islands to the east, is a must-go. Regardless of whether you appreciate botany or not, it’s worth noting that St. Thomas is native to some of the most gorgeous flowers in all of the U.S. Virgin Islands. 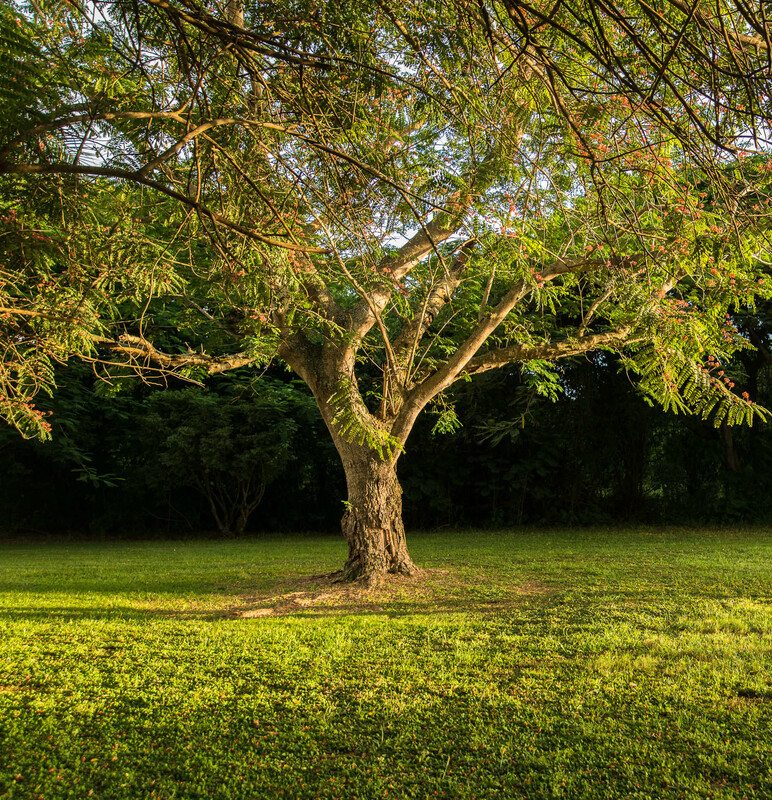 Stop by Phantasea Tropical Botanic Garden or St. Peter Mountain Greathouse & Botanical Gardens for incredible nature trails filled with streaming waterfalls, bird aviaries, fish ponds, and dozens of lush Caribbean plants, fruits, and flowers. As far as the St. Thomas bar scene goes, it doesn’t disappoint. As cliche has it may be, Sarah and I went on a cruise around the U.S. Virgin Islands, so naturally, we had to stop at Senor Frogs. It’s literally the first spot we saw after jumping off the ship– and if these pictures aren’t enough of an indication, it’s a blast. You can’t do dinner and drinks without dessert, right? 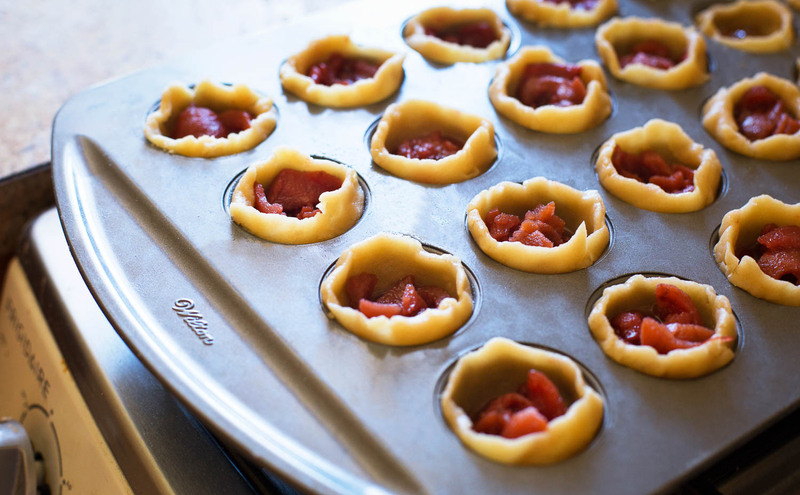 Stop by My Brother’s Workshop Cafe and Bakery for some coffee and fresh guava tarts or local Johnny Cakes. They’re located just one block off the main shopping street in Charlotte Amalie, and they’ve got a stellar customer reputation– both for their food and their philanthropy. They were recently featured in Destinations Magazine for creating an incredible youth program, which offers at-risk teenagers on the island business training and trade experience. 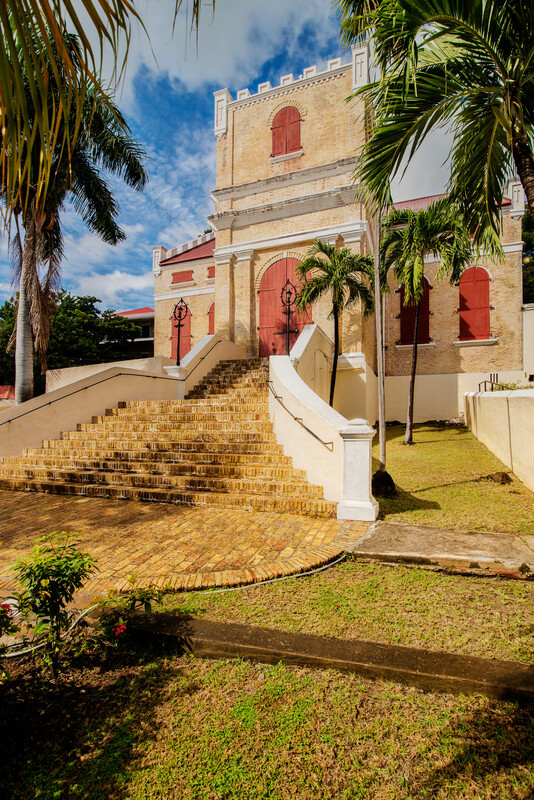 St. Thomas is also pretty flush with historical landmarks, specifically cathedrals and cultural buidlings. For me and Sarah, one of the most incredible spots was the Frederick Lutheran Church. Its revivalist style structure was completed in 1844. Another really unique landmark is the Beracha Veshalom Vegimulth Hasidim Synagogue, also known as the St. Thomas Synagogue. It’s the second oldest synagogue in the Western Hemisphere. If you look closely at the floor, you’ll notice the sand-floor interior. The sand signifies the time during the Spanish Inquisition when practicing Judaism was punishable by death. Jews would actually worship in cellars with sand on the floor to absorb the sound. It’s just a really incredible place, and admission is free, although donations are accepted and appreciated. Other must-go historical St. Thomas landmarks are the 99 Steps, which were built by the Danes in the mid-1700s, and Blackbeard’s Castle, which is a watchtower built (again) by the Danes in 1679. According to legend, the infamous Blackbeard used the tower to watch for ships entering the harbor. Side Note: If you have no idea who the Danes are, give The Last Kingdom a watch on Netflix. So good! So yeah, leaving St. Thomas wasn’t easy. Actually, leaving the U.S. Virgin Islands altogether was incredibly difficult. We had such a phenomenal time, and it really was the best way to send Sarah off to work her altruistic magic in DC. Have you gone on any spring break trips or summer getaways to St. John, St. Croix, or St. Thomas? 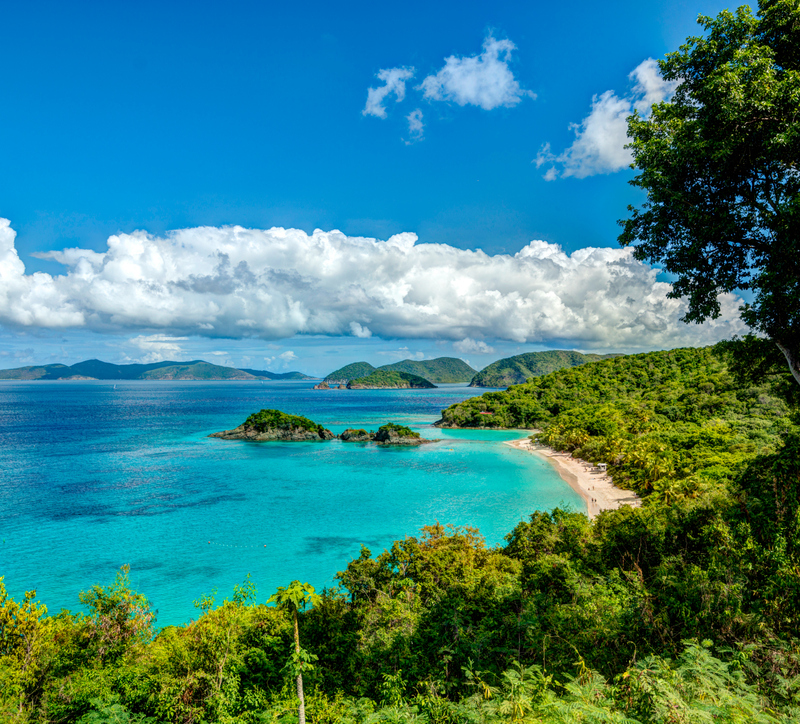 Which island was your favorite– and what were some of your all-time favorite things to do in the U.S. Virgin Islands? If you haven’t, check out www.visitusvi.com and start planning that vacation! For more of my favorite adventurous travel guides, click here for my Big Island Travel Guide and click here for my Guide to the Ultimate Southern Road Trip! Happy exploring! Such a great post – love the photos, they make me want to dive right it!! OMG YOU look stunning! THIS is stunning! THE ISLANDS are stunning! I am dreaming of going to a place like this. It is just sooo far away from Europe. I usually go to Asia when I want beaches like that. Okay, not only does it look like you had the best time, but I’m TOTALLY swooning over these adventures and pictures! I want to go to the tropics so bad! This is such a good travel guide Stephanie!! My parents took me to the US Virgin Islands when I was 3- I think it was my first vacation! I would love to go back- how beautiful! Looks like such a fun trip! Those sugar plantation estates are beautiful. Also swooning over the color of that water; can I go on vacation now? 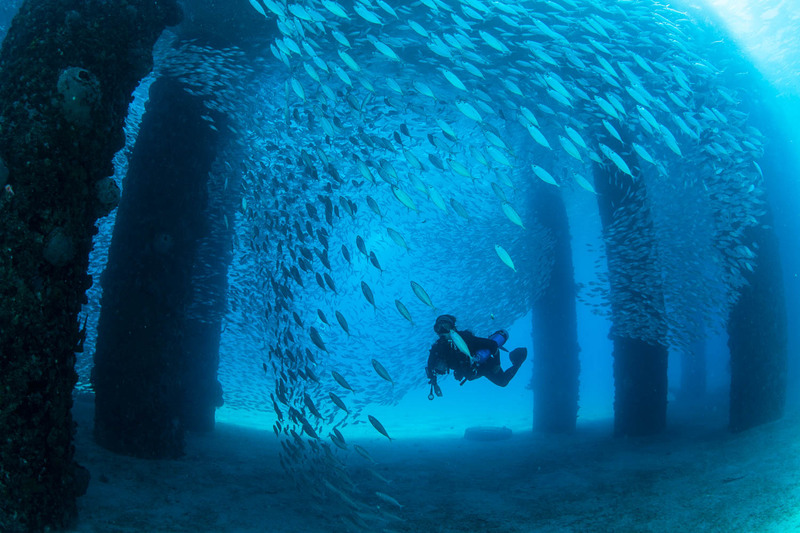 This looks so amazing… especially the scuba diving. My husband went to the BVIs a few years back for some diving certification. I’ve got to show him these pics. A trip may be in order to the American islands! Your pictures are absolutely stunning! It looks like you had a wonderful time! ahhh this looks like paradise hopping! i seriously want to go on vacation now! How fun! Apparently I’ve been to St. Thomas when I was younger, but I don’t remember a thing! The bracelets are super adorable also. Beautiful places! I’ve never thought about going there. Adding them to my list! Your pictures and experiences are so awesome – I thought I was there with you. Thanks for the great vacation idea! Isn’t island hopping the coolest thing?! I love this, I need to try hopping through this chain of islands! I’ve been to St Thomas but not the others, they’re stunning! This trip just looks heavenly. I’m dying to travel somewhere tropical soon.